Maybe your thinking of starting some sort of weight loss programme and want to know can you lose weight running? After all, you don’t see many “fat” runners, do you? Where do you start and how do you start? 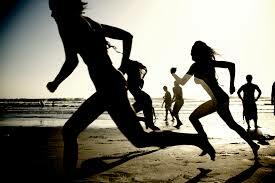 If you have never run before then there are a few things you should know, how many calories is it going to burn? What effect will it have on the shape of your body? Is it safe for overweight people to “just” run? If your not sure about the difference between losing weight vs losing body click the link as it’s important you know the difference If we do continuous running this will fall into losing weight and performing HIIT will fall more in the losing body fat category we will cover both later on in this post. Running is in our biological makeup, our ancestors would have to run to catch food, but if we think about this most animals are faster than us right? That would leave Two possible solutions, to outsmart the animal or out run it. As you can imagine there wasn’t many if any overweight humans back then, so running is definitely going to help you “lose weight” unlike our ancient ancestors we don’t have to run after our meals anymore unless where trying to get that late night burger before it shuts. On top of losing weight and body fat running has numerous other benefits as well, it will help keep your heart healthy, breath easier and if done properly good joint health, it won’t take long to start feeling these benefits. No need to worry I Cant either nor do I want too, I have never been into continuous running I can’t stay motivated to run any further than a mile or two….. If you struggle to run any length of distance at all then start small, what I used to do with a friend of mine who wanted to lose weight by running was pick two points usually lamposts and then run at your own comfortable pace and then every week extend the lamp post by about three more. This is such a powerful way to make you believe that’s it’s possible, my friend had the mentality of “I can’t run so I won’t” but when his daughter started getting to about 3-4 he was struggling to keep up during games and having to make up an excuse to rest. Let’s look at how we can build on this first pick a distance that you would love to be able to complete could be 1 mile 5 mile or whatever you like but make it realistic as were looking to get there within 8 weeks now open google maps up and plot that distance of your desired goal. Screenshot and save somewhere on your computer and forget about it for 10-12 weeks perhaps set an alarm on your phone or something. At the moment this distance seems impossible to you right? Let’s go back and look at the lamp posts idea I did with my friend, how many lamp posts are in that distance you plotted do you think? 10, 20, 30? what it ever it is it’s not important, the important part is breaking the end goal down into lots of little goals. For your first week, your just going to break yourself in, the aim is to do 3-4 runs a week. Your first run should be to run as many lamp posts as you can this will be your starting point on your second run you go one lamp post further. Second week and onwards is always about pushing it a couple of lamp posts further you will quickly realise how much further you’re getting by doing this technique as long as you keep pushing it further and further you will reach that goal, the bigger the goal you set to start off with the bigger the smaller goals will have to be. Continuous running like this will eventually lead to “weight loss” so you will have the skinny look without no toned muscles if not used in conjunction with other training methods if you want to lose body fat and maintain muscle read below. That’s fair enough we live in hectic world, the good news is you don’t have to and by doing high-intensity interval training (HIIT) not only will you save time but will get better results, HIIT helps preserve lean muscle but burn body fat not just whilst your exercising but up to 48 hours after you finish. For HIIT we can take the same principle of using to land markers such as lamp posts, you don’t need to worry about making an end goal as you don’t want or bothered about running long distance. For HIIT you’re going to give your maximum effort by running (sprinting) from one lamp post to another then simply walk back and repeat. Once this starts getting easy have some fun and mix it but you always have to sprint so sprint 3 lamp posts and walk back one you can get creative as your body will never get used to it as your constantly refreshing your routine. Your fitness and weight loss will be phenomenal and I would advise HIIT over continuous running all day every day except if you’re training for something specific like a marathon. If you really want to spice things up the add a hill, sprint up walk down and repeat. For both of these different practices, it’s important to do it right so follow tips below to enjoy the experience much more. Get the all clear for exercise DO NOT undertake any fitness programme before being medically checked up by a profession! Hydrate frequently, take little sips during the exercise period. If you want to lose weight fast and predominantly body weight then do HIIT as with continuous training your body will start to eat into your muscles for energy when you’re all out of fat reserves. Running is great for slimming and generally for your health just be careful though as road running puts a lot of shocks through your body and if you’re overweight this will add to the strain. If running outside isn’t for you check out my Best home treadmill review. I love the answers that the article gives in relation between losing weight and running. I too believe that if you are a focused target group you get motivated to keep running and non-runners to start running. An interesting and well-planned post. Thanks for the great information on running and I especially love the tips. So often we do not pay attention, especially to the safety tips and endanger ourselves. I am encouraged. An awesome post my friend packed full of sensible advice and written from some knowledge on the subject one would assume? I knew that running would obviously be great for weight loss but it is amazing how many overweight people never give it a second thought! it certainly is talking to people who are overweight show a clear thought pattern when it comes to running there just so put off by it as they think you have to run for miles to see results. This is far from the truth and if you break the goals down then it is a lot easier than thought.